Unsold inventory and legal hurdles unfavourably impacted customer sentiments and the realty market in Delhi NCR. After a three per cent average price movement in Oct-Dec 2014, the capital city has grown insignificantly by one per cent in Jan-Mar 2015. In line with the previous quarter, property prices and new residential developments in Delhi NCR did not witness any significant growth. Rental market performed better than the capital market owing to weak investor sentiments and inflated property prices. The State Government’s announcement to regularise illegal colonies in Delhi brought some cheer amongst the end-users and investors. The removal of ban on selling leasehold properties was also seen as a positive step for homebuyers in NCR. Impending legal battles over land acquisition and clearance from the National Green Tribunal (NGT) led to negative customer sentiments in Noida and Greater Noida. Announcement to develop infrastructural projects worth Rs 7,000 crore in Noida is seen as a growth stimulator in an otherwise grim market. Affordability and planned connectivity by the Delhi Metro kept the residential demand in Ghaziabad afloat. In a bid to meet the need for affordable homes in Delhi NCR, the UP Housing and Development Board proposed housing units within a budget of Rs 15-30 lakh in Ghaziabad. Even Delhi Government came up with plans to develop houses in the Economically Weaker Section (EWS) and Low-Income Group (LIG) categories. The Haryana Budget allocated funds for fast-tracking the Faridabad Metro and the Bahadurgarh link, which are expected to reap healthy returns in future. 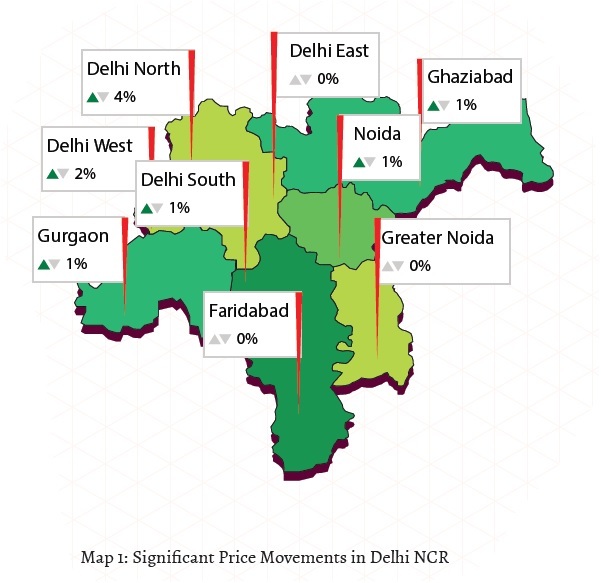 The overall two per cent price movement in Delhi was a cumulative result of the price changes in several regions. While the East recorded stagnant prices, North Delhi and Dwarka saw a four per cent hike each. South and West Delhi witnessed an average growth of one to two per cent. Improved buyer sentiments owing to comparative affordability to Gurgaon attracted buyers to Dwarka. Sectors 10, 12 and 17 emerged as the top grossers with eight to nine per cent price hike. These sectors are conveniently connected via the Delhi Metro. From South Delhi, Greater Kailash I and Lajpat Nagar recorded eight per cent price rise, each. The recent opening of road sections causing massive traffic jams propelled customers back to these high-demand areas. East Delhi localities such as Vasundhara Enclave and Patparganj also saw low sale volumes. However, robust enquiries kept the market bouyant and resulted in an insignificant dip in property prices to the tune of one to two per cent. Kundli and Narela, from North Delhi, recorded a healthy price rise of five to seven per cent. Inclusion in the Master Plan 2021 by Delhi Development Authority (DDA) and planned connectivity by metro acted as major catalysts of growth for these areas. Lower preference for buying increased the rental demand in Delhi in the last one year. Overall, the rental market grew by two per cent. While Dwarka recorded an eight per cent jump, North and West Delhi recorded a four and five per cent average hike, respectively. Higher ticket price in South Delhi resulted in stagnant rental values. 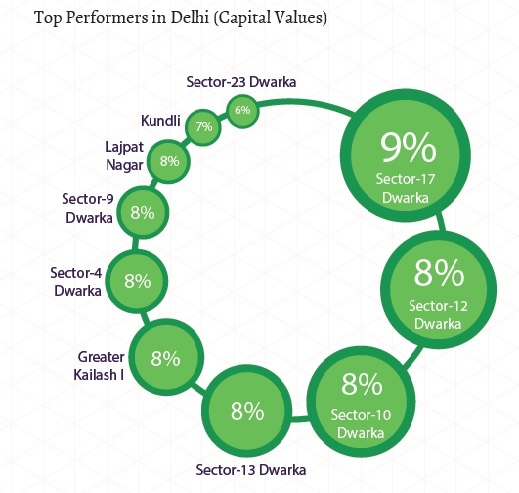 Amongst the top performers were localities from Dwarka such as Sectors 4, 10, 18A and 18B. The rental values in these areas went up by 15-23 per cent in the last one year. All these sectors enjoyed easy access to the metro and offered well-developed social infrastructure. Proximity and comparative affordability to Gurgaon attracted several home seekers here. 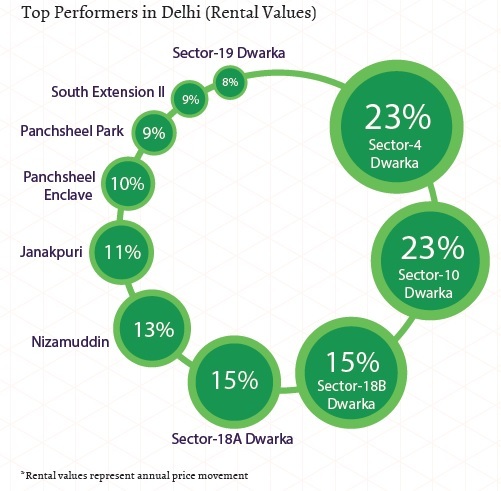 From the South, localities such as Nizamuddin, Panchsheel Enclave, Panchsheel Park and South Extension II recorded a healthy rise in rental values (nine to 13 per cent). Planned connectivity by Delhi Metro and limited inventory are the major factors for rising lease rates. With the Government regularising illegal areas and promising development of infrastructure in the state election manifesto, realty sentiments in Janakpuri remained bouyant. This resulted in an overall spike in rental values by 11 per cent. Gripped by legal battles, unsold inventory and weak customer sentiments, Noida and Greater Noida failed to grow in Jan-Mar 2015, as compared to Oct-Dec 2014, when capital values in Noida grew by three per cent and that in Greater Noida by four per cent. The plan of two metro lines in Greater Noida, with one extending towards Yamuna Expressway, did not propel property prices but managed to keep sentiments afloat, resulting in stagnant prices. 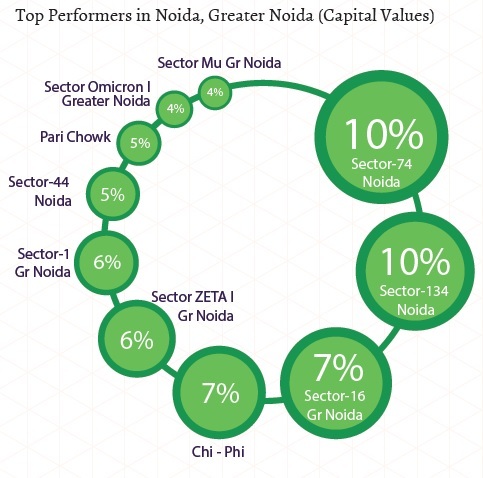 Sectors 74 and 134 in Noida emerged as the top performers in the zone, with 10 per cent price rise each. Considerable positive price movement in the premium residential project of Sector 74, Supertech Capetown, led to an overall spike in the locality. Dominated by developments from the Jaypee Group, Sector 134 grew on account of affordability. The upcoming Faridabad-Noida-Ghaziabad (FNG) Highway, which will pass through Sectors 137 and 142, located nearby, also impacted customer sentiments positively. From Greater Noida, Sectors such as 1, 16, Chi-Phi and Zeta I recorded maximum price hike of five to seven per cent. All these localities saw increased buyer interest due to improving connectivity and price efficiency. Industrial development in Surajpur led to a growth in property prices by three per cent this quarter. Higher preference for renting instead of buying properties in the two zones led to an average increase in rental values by two per cent in the last one year. 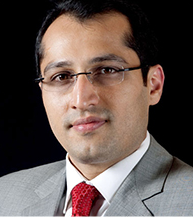 While in Greater Noida, the rentals rose by about seven per cent, in Noida they remained stable. Affordability and improving connectivity were the major stimulators of the rental market in Greater Noida. Sectors Zeta and Zeta I in Greater Noida emerged as the top grossers with about 14 per cent annual hike. Reasonable rental values and availability of ample properties in both furnished and semi-furnished conditions attracted several home seekers. 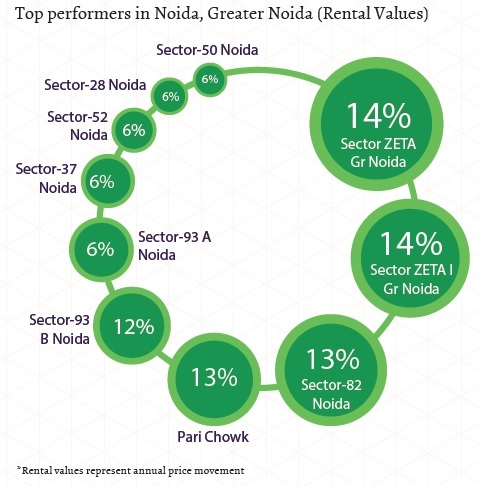 Sector 82 in Noida followed Sectors Zeta and Zeta I with 13 per cent price appreciation in one year. Maximum demand for rented accommodations was recorded in Kendriya Vihar located here. With several projects being completed, Sector 93 witnessed increasing occupancy, thereby, higher rental rates to the tune of six to 12 per cent. Since Sector 93A has more premium projects in comparison to Sector 93B, the area recorded a meagre price movement as compared to its counterpart. Consistent demand and limited supply of properties kept rental movement robust in the developed sectors of Noida such as 28, 37, 50 and 52. The prices in these sectors went up by six per cent, each. Replete with affordable and mid-range properties, Ghaziabad recorded robust housing demand. The general negative sentiment in the market, however, impacted sales translating into a meagre price appreciation of one per cent this quarter. Announcement of plans to boost infrastructure in Ghaziabad in the UP Budget brought some positivity amongst investors and end-users. Ahinsa Khand 1, which boasts of seamless connectivity and well-developed social infrastructure emerged as the top grosser with seven per cent price rise between Oct-Dec 2014 and Jan-Mar 2015. Crossing Republik and Siddhartha Vihar followed Ahinsa Khand I by delivering similar return on investments (six to seven per cent). Affordable properties and planned metro connectivity gave the required fillip to customer sentiments, resulting in an increase in the asking rates in the secondary market. Insufficient inventory in Shalimar Garden Extension I pushed property prices by six per cent. Connectivity by metro kept housing demand high. Vasundhara showed consistent growth of seven per cent in this quarter. Proximity to NH-24, Anand Vihar ISBT and metro made this locality one of the most preferred areas in Ghaziabad. Attracting the workforces of Delhi, Noida and Ghaziabad, the region saw healthy demand for rental properties, thereby, recording an average growth of five per cent in last one year. Located just opposite the industrial areas of Noida, Sectors 62 and 63, Vaibhav Khand in Indirapuram recorded maximum housing demand, and therefore, maximum hike in rental rates. The rates went up by 25 per cent in the last one year. An average 1000 sq ft apartment which could be leased for Rs 10,000-12,000 per month, is now available for Rs 15,000-17,000 per month. Connected by the metro and offering better approach to Delhi and Anand Vihar ISBT, Kaushambi recorded a surge in rental rates by 15 per cent. 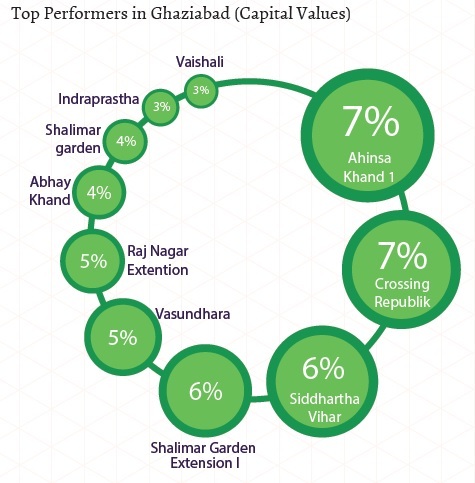 Crossing Republik, which is expected to be connected by metro in future, saw increased demand for rental properties due to comparative affordability to almost all localities of Ghaziabad, such as Indirapuram, Kaushambi and Vaishali. In addition to being preferred by investors, Ahinsa Khand in Indirapuram garnered a lot of interest from end-users too. While the rental rates in Ahinsa Khand II went up by nine per cent in the last one year, that in Ahinsa Khand I went up by eight per cent. While Bhiwadi and Faridabad did not witness any price change in the current quarter, Gurgaon recorded an insignificant hike of one per cent. Mapping the distance between Delhi and Jaipur and passing through Gurgaon, localities falling across NH 8 garnered healthy interest from homebuyers due to its price feasibility in comparison to other developed areas of the city. With several sectors of New Gurgaon falling along the highway, it emerged as the top grosser in Jan-Mar 2015 with 11 per cent price appreciation. Following it, Sector 82 of New Gurgaon recorded nine per cent appreciation. 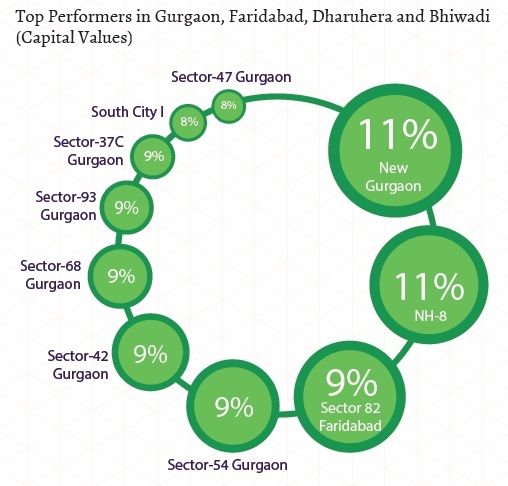 Some other sectors of New Gurgaon which recorded healthy price growth to the tune of four to eight per cent were Sectors 81, 85, 88 and 93. Proximity to Pataudi Road, in addition to affordability and residential and infrastructural development proved to be added advantages. 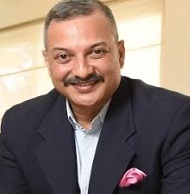 Premium localities on Golf Course Road, such as Sectors 42 and 54 recorded a price appreciation of nine per cent, each, owing to healthy demand. 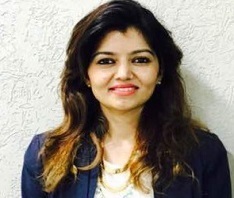 South City I too continued to attract homebuyers for its strategic location in the city and connectivity by both Delhi Metro and Rapid Metro. Amongst the top non-performers in the region were Manesar in Gurgaon and Sector 88 in Faridabad which recorded a price dip of 10-11 per cent. The rental market remained robust in both Gurgaon and Faridabad. Both the locations saw average rentals going up by three to four per cent in the last one year. Despite lacking convenient approach to the metro, Sector 55 Gurgaon emerged as the top grosser with 25 per cent appreciation. 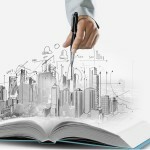 Its proximity, yet comparative affordability to all DLF Phases drew home seekers here. The rental rates in Sector 55 are almost half than those in DLF Phase IV and V, located 3-6 km away. 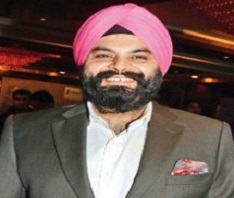 Attracting top-management professionals of the IT companies, DLF City recorded a price growth of 17 per cent. Metro also played a major role in pushing the asking rates in this area. In Faridabad, Nehar Par continued to be the most preferred rental destination, hence, recording a growth of 13 per cent. Planned connectivity by Faridabad-Nehar Par-Gurgaon Expressway kept customer sentiments high. The soon to be functional metro until YMCA Chowk also fuelled rental demand in the area. Sector 89 in Gurgaon recorded the maximum drop in rental rates (11 per cent). With only a few towers in some projects delivered, the area saw low occupancy rate. 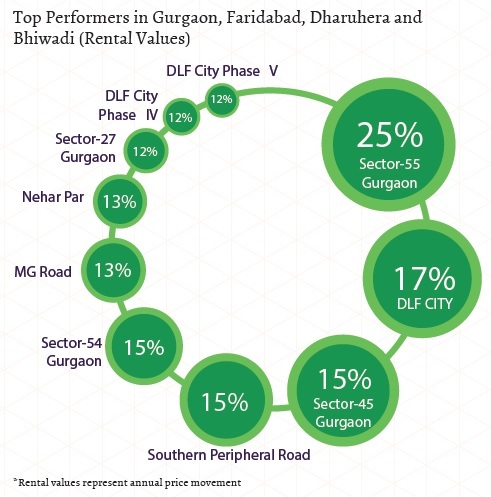 DLF Phase II saw a 10 per cent drop as it majorly offers independent houses/villas, whereas, the city saw maximum demand for multi-storey apartments. Compartmentalised into various ticket sizes in different parts of NCR, the city offered a fair mix of property types in various budget ranges. Mid-sized homes garnered maximum interest as they are affordable and are easy to maintain. Supply of various property types in Delhi NCR recorded considerable variations in the current quarter, vis-a-vis the previous one. While multi-storey apartments continued to be the most supplied property type in the city, its availability dropped to 64 per cent in Jan-Mar 2015, from 71 per cent in Oct-Dec 2014. The seven per cent drop in supply of residential apartments was compensated by an increased supply of independent houses/villas and builder floors. Supply of builder floors increased by four per cent and stood at 29 per cent, making it the second most supplied property type in the city. 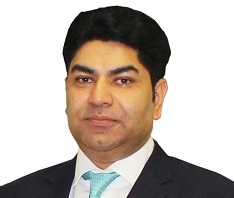 Independent houses/villas recorded a three per cent hike in its supply and thus, made up seven per cent of the total market share, the least in the city. There were only slight variations noticed in the supply of various budget ranges in the last three months. The high income bracket of Rs 60 lakh to Rs 1 crore continued to be the most supplied in the city. Its supply dropped insignificantly since the last quarter and stood at 23 per cent. Between all localities of Delhi NCR, this budget range saw maximum availability in Faridabad, Noida and Gurgaon. Amongst all other budget categories, the city saw an almost equal distribution of affordable housing (Within Rs 40 lakh), luxury housing (Rs 1-2 crore) and ultra luxury housing (Rs 2-5 crore). All three budget ranges made up 20-21 per cent, each, of the total market share. 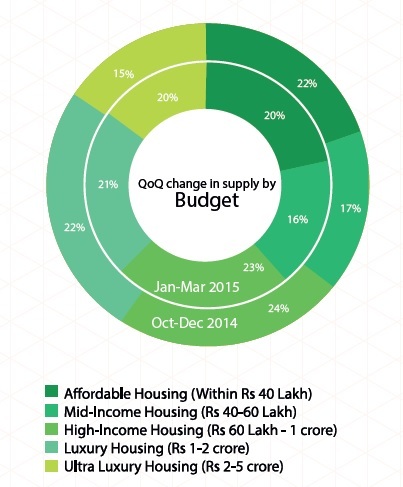 Supply of affordable housing (Within Rs 40 lakh) dropped by two per cent in this quarter. Most of these units were supplied in Ghaziabad and Greater Noida. Close to 55 per cent of these units were ready-to-move-in, with the rest being under-construction. While supply of luxury housing segment increased insignificantly, supply of ultra luxury segment saw a hike of five per cent in the last three months. Gurgaon continued to see maximum supply of properties in the budget range Rs 1-2 crore (luxury housing), whereas, the ultra-luxury segment (Rs 2-5 crore) found its major market in Delhi. The mid income housing category of Rs 40-60 lakh recorded the lowest supply of 16 per cent. Faridabad saw maximum availability of units in this price range. 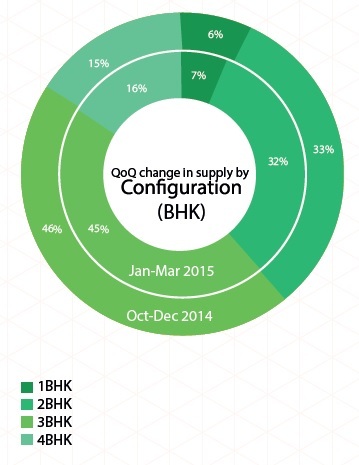 Similar to the previous quarter, 3BHK units continued to be the front runners in Delhi NCR’s inventory. 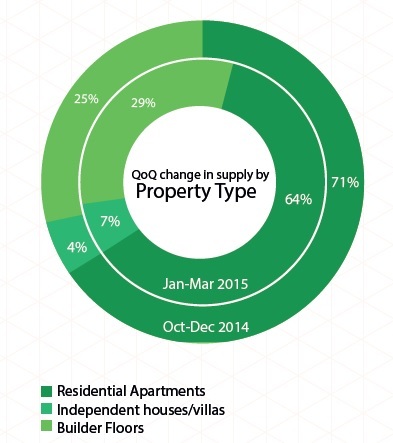 The category recorded close to 45 per cent supply in Jan-Mar 2015, slightly lower than the previous quarter. All regions, except Ghaziabad and Greater Noida, offered maximum number of 3BHK units. Close to 60 per cent of the total 3BHK units available in Delhi NCR were read-to-move-in, with the rest being under construction. Having a slightly lower ticket size, 2BHK units remained the highest supplied in Ghaziabad and Greater Noida. Overall in Delhi NCR, this configuration captured 32 per cent of the market share. Larger homes of 4BHK configuration recorded 16 per cent supply in the city, with Gurgaon and Delhi offering majority of them. Compact homes configured as 1BHK were the least supplied in the city and made up seven per cent of the total market share. About 70 per cent of them were ready-to-move-in. Majority of these units were delivered in Ghaziabad, followed by Delhi and Greater Noida. In Jan-Mar 2015, close to 60 per cent of the city’s total inventory of properties available on sale were ready-to-move-in. Delhi, Faridabad and Ghaziabad had close to 75 per cent of the total properties available as ready-to-move-in units. Noida and Greater Noida had the lowest share of ready-to-move-in properties due to maximum residential projects running delayed in Noida Extension and Noida-Greater Noida Expressway. Close to 70 per cent projects in Noida and Greater Noida remained under construction in this quarter. 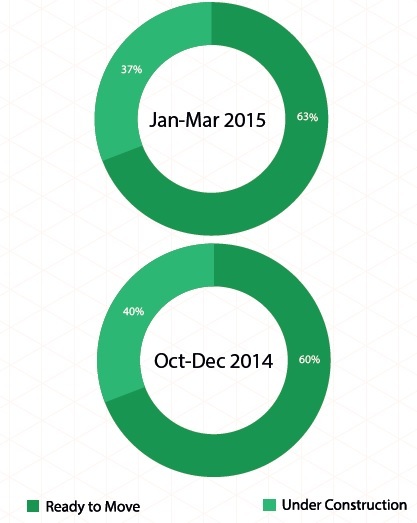 Overall, the number of under construction properties dropped from 40 per cent in Oct-Dec 2014 to 37 per cent in Jan-Mar 2015, indicating slow pace of new launches. *Capital values represent quarterly change. * Rental Values represent annual change. It’s a wonderful report. Very insightful! Will private equity funding aid revival in residential realty?